Copying and pasting ABAP report programs from one system to another normally leaves one obvious casualty: selection screen texts. Here I show you how to include them in the source of a program to make them portable. Of course, if you are really serious about sharing program components with colleagues or friends, I would recommend the fantastic abapGit by Lars Hvam. Previously we also used to have SAPLink but I suspect abapGit has now supplanted that. So consider what I am showing you here more of an interesting curiosity, though perhaps it can come in handy one day. The other possible use for this is to change selection screen texts dynamically. 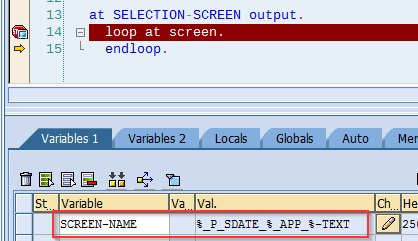 The field that SCREEN-NAME refers to here, “%_p_sdate_%_app_%”, is the field generated for the label of the defined parameter. It has a single field, “TEXT”, which you can set in your program. When we run our program now, the selection-screen shows these texts. You can now copy and paste the source code between systems and still preserve your selection screen texts without worrying about copying the selection texts of the program. (Again, use abapGit if you want to do it properly). I just find this useful for sharing code on GitHub Gists, for example. You will probably see the pattern that is applied to the generated field names, but it might be safer to just determine them from looping at SCREEN in debugging. All of this comes, of course with a caveat: If you already have texts defined in the program, these will overwrite them. But in that case, you can just delete the code that modifies these texts. This entry was posted on Wednesday, July 26th, 2017 at 8:25 am and is filed under ABAP, Tips and Tricks. You can follow any responses to this entry through the RSS 2.0 feed. You can leave a response, or trackback from your own site.